Nickname/Referenced as the "Streak of Bronze to Wild Fire"
In 2004, a film was created based on the life of Tom, called "Chiefs & Champions: Tom Longboat"
In 2016, David M General designed and sculpted the Tom Longboard monument during the Pan Am Games. It recognized his traditional native values, his role as a runner, and a soldier in the war. In addition, a video "Tom Longboat: Unveiling the Challenge and Triumph" was created in his honor with Tom's close family. In 2018, Tom was awarded 2018 Toronto Sport Legend. He was inducted into the Toronto Sport Hall of Honour where his family attended the Induction Ceremony on April 27, 2018 at the Toronto Pan Am Sports Centre on his behalf. Born July 4 1886. Tom’s parents were George Longboat & Elizabeth Skye. He belonged to the Wolf Clan of Onondaga Nation. Tom’s father died when he was 5 years old. At 12 years old, he attended the Mush Hole where he was pressured to give up his language and beliefs for Christianity. 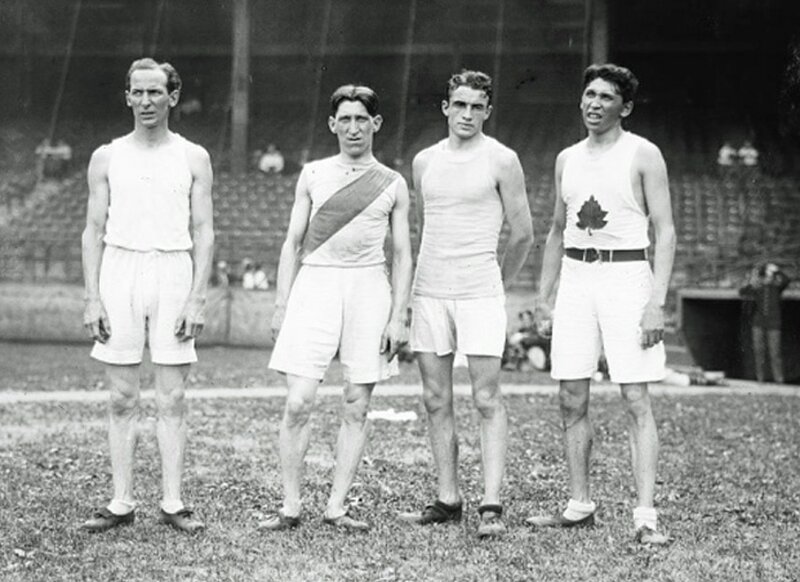 Later in his years, Tom’s first competition was a race from Caledonia, through Hamilton and to Toronto. He was 17 years old, standing at 5’9’’ and weighing in at 150 pounds. By the end of his ammeter running career, Tom was titled Professional Champion of the World after his race in Madison Square Garden, New York City in 1909. During his running career he became known as the Streak of Bronze to Wildfire. After fame and success Tom was invited to speak at the Mush Hole residential school. He refused stating, “I wouldn’t send my dog to that place”. Tom, in his day was labelled as lazy in his training, Today it is common practice for many runners today. His running style was high intensity with easy recovery days. The former route was 24.5 miles (39.5 km). Boston 1907 was cold, wet, and weather. Tom broke the record with 2:24:24. Organizers changed the route the next year. Tom was 19 years old. At 20 years old, he was representing Canada at the Olympics. He did not finish the event as he collapsed in the last mile, as did another contending runner. It was speculated that they were both drugged. That was his last Olympics. Shortly after, a rematch of the Olympic Runners was held at Madison Square Gardens and Tom won. April 27, 2018 - Tom Longboat was inducted into the Toronto Sport Hall of Honour as a Sport Legend for the year of 2018. He was described as the most celebrated pre-WWI athletes, who despite having to face much racist criticism, stuck to his own methods. The award was accepted by Tom's relatives. "It is our relationship with creation that he was gifted with speed, agility, and endurance. Running is a natural part of life"
Thomas Charles Longboat did not receive any awards for bravery. He was not killed in the thick of battle while performing a daring feet above and beyond the call of duty. Rather, he is an example of the selfless response of Canadians to the chaos spreading throughout Europe. His running had earned him thousands of dollars by February 1916 when, at the age of 29, he set aside his athletic career to enlist. Though the rewards were substantially less, he did not quit racing. 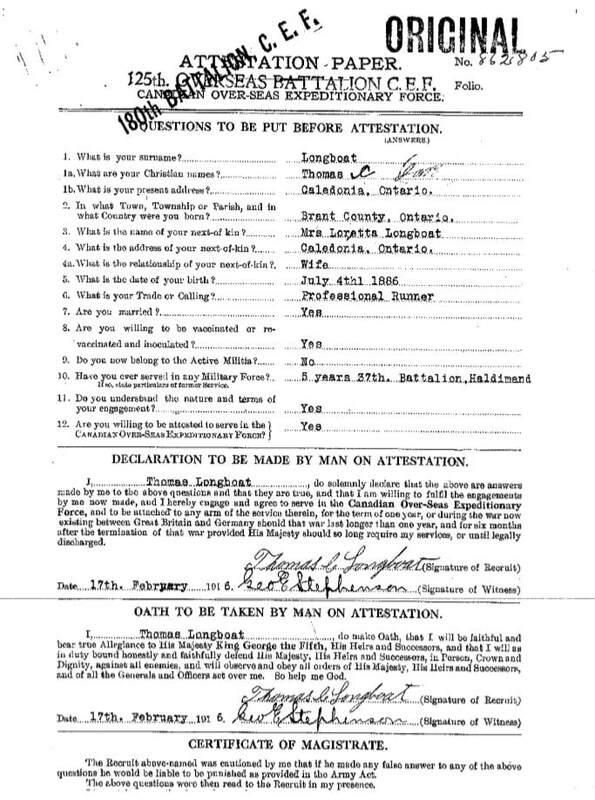 As a dispatch carrier with the 107th Pioneer Battalion in France, Longboat ran messages and orders between units. He also kept in competitive form by racing in inter-battalion sporting contests, many of which he won. At the 1918 Canadian Corps Dominion Day competitions, Longboat won the eight-mile [13-kilometre] race. The famous runner was wounded twice during his time of service. Once he was declared dead, but he survived the war and returned to Canada in 1919.